Service based architectures and centralized systems to generate documents help to build clean and structured software concepts. Creating documents by merging templates with data is a typical task for an HTTP service. Before we are walking through the steps that are required to create an ASP.NET Web API project with Visual Studio, the JSON data objects are explained. These helper classes simply keep the data that is encrypted as an JSON object and used for the data transportation. The class MailMergeRequestObject consists of the template in the internal TX Text Control format and data as an JSON object. The ResponseResults object, that comes back from the HTTP service, holds the resulting document as a byte array in the internal TX Text Control format. Open Visual Studio (in this tutorial, Visual Studio 2015 is used) and create a new ASP.NET Web Application. 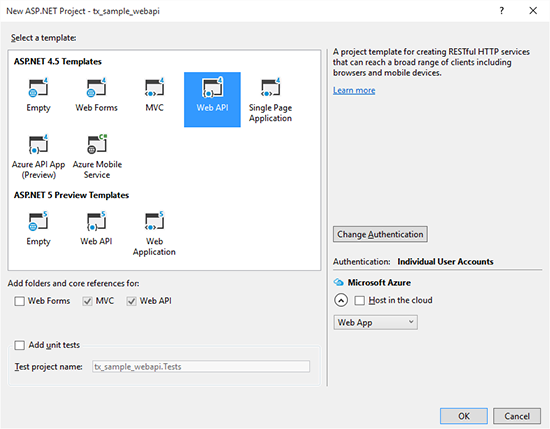 Select Web API as the project template and confirm with OK. Select the project in the Solution Explorer and choose Add Reference... from the Project main menu. 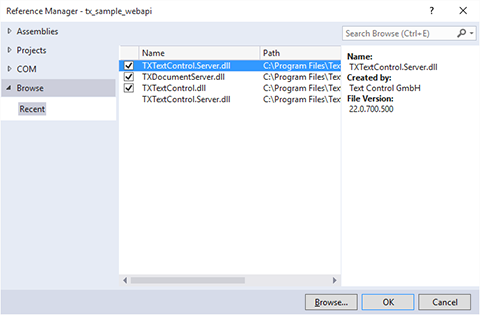 Browse for the assemblies TXTextControl.Server, TXDocumentServer.dll and TXTextControl.dll, select them and confirm with OK. In the Solution Explorer, right-click the Controllers folder and choose Controller... from the Add context menu. 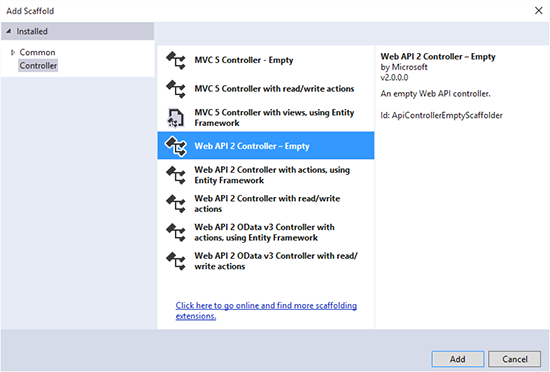 Select Web API 2 Controller - Empty and confirm with Add. Name the controller MergeController. The following demo project code shows how to read an XML data source and a template, package both into a JSON object in order to call the Web API using an HTTP Post request. An electronic signature is in many processes legally sufficient to prove an identity. This article looks at how add an electronic signature to documents in ASP.NET. An electronic signature is in many processes legally sufficient to prove an identity. This article looks at how add an electronic signature to documents in Web.TextControl.